Pablo Artal was born in Zaragoza (Spain) in 1961. He received his M.Sc. degree in Physics from the University of Zaragoza, Spain, and the Ph.D. degree in Physics (Optics) from the University Complutense of Madrid in 1988. He was a post-doctoral fellow at the Institut d'Optique, Orsay, France in 1989-90 and a senior researcher at the Instituto de Optica (CSIC) in Madrid from 1990 to 1994. 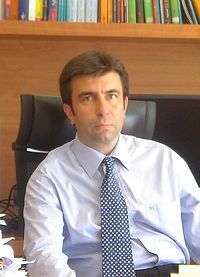 Since 1994, he is full Professor of Optics at the University of Murcia, Spain. He spent several periods doing collaborative research in laboratories in Europe, Australia and USA. Prof. Artal was secretary of the Spanish Optical Society (SEDO) from 1990 to 1994; associated Dean of the University of Murcia Science Faculty from 1994 to 2000 and Director of the Physics Department at Murcia University from 2001 to 2003. From 2004 to 2007 he was in charge of the reviewing grant panel in Physics at the Spanish Ministry of Science. Since 2006 is the director of the Center for Research in Optics and Nanophysics at Murcia University. He is a member of SEDO, EOS, ARVO and SPIE. He was elected fellow member of the Optical Society of America (OSA) in 1999. Prof. Artal received a number of national and international research awards. Prof. Artal is the founder and director of the Laboratorio de Optica at the University of Murcia with about 20 co-workers. He has published more than 120 reviewed papers (with more than 3000 citations), presented more than 100 invited talks in international meetings and around 120 seminars in research institutions around the world. He has been funded by more than 4 Million € grant money since 1993 and is also a co-inventor in a number of international patents. Dr. Artal's research interests are centered in the optics of eye and the retina and the development of optical and electronic imaging techniques to be applied in Vision, Ophthalmology and Biomedicine. He has pioneered a number of highly innovative and significant advances in the methods for studying the optics of the eye and has contributed substantially to our understanding of the factors that limit human visual resolution. In addition, several of his results and ideas in the area of ophthalmic instrumentation over the last years have been introduced in instruments and devices currently in use in Vision and Ophthalmology. During the last years, he built from scratch an Optics Laboratory in Murcia University (south-est Spain), a location without any previous tradition in Optics. He was instrumental to continuously attract external financial support from government and private international companies. Dr. Artal is a pioneer in exploring the human eye with new technologies and designed new ways of optical corrections that will improve vision in patients. Several of his proposed solutions and instrument are currently in use in the clinical practice. He is dedicated to the excellence in basic research to be transferred to real life applications. "Optical Quality of the Eye in Subjects with Normal and Excellent Visual Acuity"
"Liquid crystal Adaptive Optics Visual Simulator: Application to testing and design of ophthalmic optical elements"
"Effect of optical correction and remaining aberrations on peripheral resolution acuity in the human eye"
"Mechanism of compensation of aberrations in the human eye"
"The human eye is an example of robust optical design"
"Predicting the Optical Performance of Eyes Implanted with IOLs to Correct Spherical Aberration"
"Neural compensation for the eye's optical aberrations"
"Contribution of the cornea and internal surfaces to the change of ocular aberrations with age"
"Closed-loop adaptive optics in the human eye"